By the late 19th century, Wisconsin was one of the premier lumber producing states in the U.S. Logging was not very popular among the state's first white settlers, however. Throughout most of the 1830s, logging was carried out on a small scale around Prairie du Chien, Portage and Green Bay. The lumber industry began to develop after the Menominee Nation was forced to cede much of central and eastern Wisconsin to the U.S. in 1836. But the industry faced many obstacles. Long distances between supplies and markets, bad transportation and dangerous waterways and roads made lumbering difficult. Despite challenges, the lumber industry became the backbone of the state's economy by the middle of the century. Because the Wisconsin River provided easy transport between forests and early settlements, forests along the river were the first to be clear-cut. Rivers were a convenient means to transport pine logs from forests to mills. The mills used huge saws powered by the rivers to cut the logs into boards. Cities such as Stevens Point and Wausau developed around mills. Most of Wisconsin's major cities were built on rivers. One of Wisconsin's major lumbering districts was the northeastern region around the Wolf River. The Menomineee developed a successful logging business from the river, which ran through the center of their reservation. Menominee men stayed in lumber camps all winter cutting timber and hauling it by sleigh to the riverbank. When the ice broke in spring, the logs were floated downstream to Oshkosh and other mill towns. Wisconsin's other great lumbering region consisted of the watersheds of the Black and Chippewa Rivers in the northwest. Dozens of small companies there combined into a conglomerate led by Frederick Weyerhaeuser. They shipped logs and boards downriver to St. Louis, and created towns such as Eau Claire and Black River Falls. The amount of pine harvested from the Black River Valley alone could have built a boardwalk nine feet wide and four inches thick around the entire world. According to the 1890 U.S. census, more than 23,000 men worked in Wisconsin's logging industry and another 32,000 worked at the sawmills that turned timber into boards. Each winter, the lumberjacks occupied nearly 450 logging camps. In the spring, they drove their timber downstream to more than 1,000 mills. Logging and lumbering employed a quarter of all Wisconsinites working in the 1890s. Railroads transformed Wisconsin's lumber industry at the turn of the 20th century. Transporting lumber by train allowed loggers to work year-round and to cut lumber that was once impossible to float down rivers. Lumber camps were moved into the woods and increased in size. Camps soon featured Bunkhouses, kitchens, dining halls, company stores, blacksmiths and carpentry shops. The soft pine forests of northern and central Wisconsin provided a seemingly endless supply of raw material to urban markets. Wisconsin trees were made into doors, window sashes, furniture, beams and shipping boxes. They were built in lakefront cities such as Sheboygan, Manitowoc and Milwaukee. Wisconsin lumber was used to construct buildings and houses for the Midwest's growing cities. The Wisconsin lumber industry's fate was uncertain at the start of the 20th century. Earlier logging operations had cut the most usable and profitable timber. But new methods completely cleared forests of all useable trees, and even revisited areas that had already been cut over. Wisconsin's furniture, paper and leather industries required more lumber as they grew. The lumber industry had previously relied on pine trees and spared hardwoods. But to accommodate the lack of pine, lumbering began to focus on hardwoods. But efforts to bolster the lumber industry in Wisconsin ultimately failed. 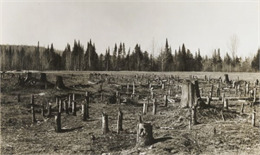 Large corporations began investing in the virgin forests of the Pacific Northwest in the 20th century. 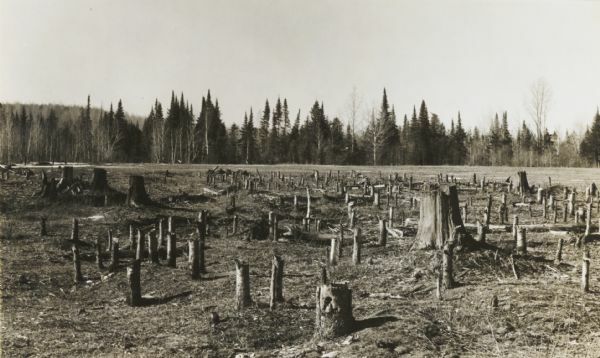 As logging declined, logging companies began to promote northern Wisconsin's cutover land for agriculture. The companies hoped to sell their land, and local governments wanted to encourage people to remain in the regions. 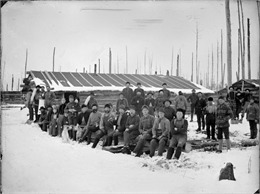 Immigrants were invited to the area and encouraged to try to turn acres of pine stumps into farms. They had little success. Some former logging towns survived as retail and distribution centers. As mills shifted away from lumber production, some towns began to focus on paper manufacturing. Many northern towns shrank into small rural communities and struggled to deal with the Great Depression. The economy of the Northwoods did not revive until the forest grew back and the tourist industry boomed after World War II.